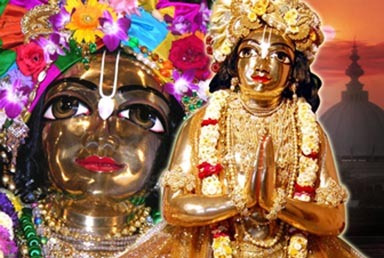 Srivas is Narada, who plays such an important part in Krishna’s lila. Narada Muni’s friend Parvata Muni appeared as Srivas’ younger brother Ramai. Srivas’ wife Malini Devi was Krishna’s wet nurse in Vraja, Ambika. Srivas Pandit hailed from Sylhet. He later came to live in Nabadwip where he made an immense contribution to Gauranga lila. From the Chaitanya Bhagavata and Chaitanya Charitamrita we learn that Srivas had three brothers living with him in Navadvipa: Srirama Pandit, Sripati Pandit and Srikanta or Srinidhi Pandit. All four were participants in Mahaprabhu’s lila. Gaudiya Vaisnava Abhidhana cites Prema-vilasa in saying that Srivas’ father was a Vedic Brahmin of the name Sri Jaladhar Pandit. Srivas Pandit was the second of five sons. The eldest son, Sri Nalina Pandit, had a daughter named Narayani, the mother of the author of the Chaitanya Bhagavata, Vrindavan Das. Narayani’s husband Vaikuntha Das Vipra died while she was pregnant with Vrindavan Das, so she left her husband’s house in Kumarahatta (Halisahar) and came to live with Srivas in Nabadwip. After a night of kirtan at Srivas’ house, when Mahaprabhu returned to external awareness, He would go with all the devotees to bathe in the Ganges. Sometimes the devotees would ceremonially bathe the Lord at Srivas Angan. One of Srivas’ servant girls named Dukhi would watch Mahaprabhu’s ecstatic dancing with tears in her eyes. She also performed the service of filling jugs of water from the Ganges for Mahaprabhu’s morning bath. One day, Mahaprabhu observed her devotion and was pleased; He changed her name from Dukhi (“unhappy”) to Sukhi (“happy”). Another day, Srivas’ only son died while sankirtana was being performed in his house. Srivas was afraid that the sounds of mourning from the women’s quarters would disturb Mahaprabhu while He was engaged in singing the Holy Names. So he went directly into the house and tried to quiet the women by explaining spiritual truths to them. When they still didn’t stop their loud lamentations, Srivas threatened to throw himself into the river and drown if they did not stop making noise. This had the desired result.